It’s been way too long since my last post and I’ve been meaning to post something for about five months now, but it just didn’t happen, somehow. So, here it goes! I’m going to post a few separate updates, but I will predate those, so you will see them below this one, just as if I posted them long ago. Nowbody will know I didn’t. Yippeeee! After about a month without internet, we’re finally back online! What a mess it has been to move our phone line and internet connection. We started by calling KPN to inform them we would be moving on September 17. We received a confirmation that our phone line would be transfered on September 29! We called to say the date wasn’t correct and so we received a new confirmation of the corrected date. We first received a letter saying that (because it’s a new house) some work still had to be done. Later, it was confirmed that all the necessary preparations had been done. In the mean time, we had cancelled our old internet provider per September 17th and subscribed to a new provider per that same date. However, our new provider called to inform us the request could not be processed until the new phone line would be active. That would be, for all we knew, on September 17th. From then it would take up to 5 weeks to get the ADSL working! Last week, I finally ordered a new laptop! This is it, a Dell Studio 15. My old laptop had become soooo slow. Even after completely reinstalling Windows XP, but hardly any other software (yes, a browser, office suite, and a few more), it still seemed ten times as slow as when I bought it. I blame Windows for that; obviously XP is not what it was five years ago. 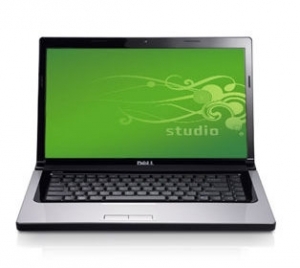 Anyway, I searched around, mainly at laptopshop.nl, and was about to order an Acer (Aspire 5738G, to be precise), when I saw that Dell had a discount on the Studio 15. The specs were similar to the Acer and now the price was almost the same as well. I chose the Dell. We have not only moved home, I have also moved my homepage. In the past years, I have had my homepage hosted at the TU Delft Visualisation Group. I have worked there for about six years, so all that time I had free hosting, lots of space and lots of features. I had also registered my domain (bvrolijk.net), six years ago, without hosting, but with domain and email forwarding, at redirection.net. So no disk space, just forwarding to the TU Delft. Ever since I left the TU, I’ve been thinking about hosting my domain elsewhere, possibly even doing it myself. My homepage consists of only a small number of pages, but I like putting some photos online, I have a wiki, which I use quite a lot, and a weblog (yep, this is it). But since there are so many good, free services nowadays (at the moment, this weblog is hosted at wordpress.com, for free and with lots of space; and I uploaded lots of photos to picasaweb.google.com, also for free and also quite spacious), I was in doubt whether it would be worth it to buy a hosting package. A few weeks ago, I found out that all links in my weblog to other weblog entries of myself, (or of Charl or Ari) had been broken after moving from cpbotha.net to WordPress.com. But I believe I have fixed them all, now! Unfortunately, I did stumble upon some other, external, broken links, for example to old news items. I’m afraid I cannot do much about that, except make screenshots of all pages I link to… 🙂 Otherwise, the Wayback Machine might be a solution? Anyway, if you find any broken links, or other things not working properly on this weblog, please let me know! Somehow, I get an error, “Invalid use of Null”, on the second line! So, rs!X is Null on the second line, but it wasn’t on the first line, or else the code would never have come to the second line! How is this possible?!? Hello world and welcome at my all new and shiny weblog. As you can see, my weblog has been moved to WordPress.com. If you haven’t done so already, please update your link or bookmark to bvrolijk.net. I have used the import function of WordPress to copy all of my old (Movable Type) weblog entries to this new system. I hope the conversion went all right, but if you see anything strange, please let me know. Many thanks to Charl for hosting my weblog these past four-and-a-half years and for his help in the conversion. I am working on a VB.NET project. The program is a Windows service that connects to an MS Access database. Everything worked fine on my own pc, but on another pc, we ran into some problems. It appeared to be related to regional settings. By default, the service ran as the LocalSystem account. I don’t know how to change the settings for that account, (anyone?) so for testing we ran the service under different user accounts. And indeed, for a user with “en-US”-settings, everything worked fine, but for a user with “nl-NL”-settings, we got weird results. Last week, we uploaded a selection of our digital photographs of our summer holiday to the HEMA, to be printed. The last time we did that, we uploaded the photos via the website. Unfortunately, the user interface wasn’t very good. Certain selections you made were forgotten and you had to make them again. We only had about 10 photos that time, so it was not such a big problem. And the print quality turned out to be very good! But this time, we wanted to upload 144 photos, so I didn’t feel like doing things two or three times. Therefore, I decided to try out the offline order software. Well, I’m not very enthusiastic about that either, but at least it remembers the selections you make. When it finally came to uploading the pictures, I was quite surprised that it went so quick. I am pretty sure that my 256 kbps uplink cannot upload a 3 MB picture in about 10 seconds. I noticed that the HEMA order software had made an “Upload” directory in its Album directory. All my original HiRes photos had been copied there, and they were disappearing one by one. But every time, the topmost picture was first replaced by a much smaller, low resolution version, before it was uploaded! I quickly copied one of those files as “evidence”. Apparently, the photos are resized to 1600 x 1200 before they are uploaded. OK, I didn’t say they could do that, but if the pictures really have to be resized before they can be printed, so be it. But the pictures were also compressed! And not just a little! My original photo was 2724 kb, with a resolution of 3072 x 2304. The uploaded picture was only 369 kb, with a resolution of 1600 x 1200. Of course, I tried resizing the picture to the same resolution myself, (without compression! ), and got a photo of 1658 kb. That’s 4.5 times larger! I thought I would wait to see the result. So today we picked up the pictures, but they’re terrible. You can clearly see the JPEG compression artefacts on some of the pictures. So, I’m certainly going back tomorrow! Because I needed a bit of extra data storage, I bought a new harddisk yesterday. I basically just wanted a lot of space, for mass storage and backup, and I wanted it to be available for every pc in our house. At first, I was looking for an external USB disk, to be connected to my Asus WL500g wireless access point. However, I decided that a NAS would be more suitable for this, and more general applicable. Of course, you can make one of those yourself, if you have an old pc lying around somewhere, but I just bought one out of the box. The best choice for me (based on the price per Gb, combined with the built-in printer server) was the Western Digital NetCenter 320 Gb. And it works just fine. I haven’t done anything special yet, nor have I performed any benchmarks, but it’s just very nice to be able to access your documents from any pc, and use the same printer, store photos and music in one place, et cetera. It does exactly what I wanted!